Please send an e-mail to the webmaster if you'd like to sign Larry's guestbook! We've been on your boat last month with the group from Yachtclub. We've hed a wonderfull time and enjoyed the diving very much. Everything was in tip top shape and we've especially liked the deflatble side's of the boat, an excelent idea! I also made an picture of your gide (Silvia I beleave) with a eagle ray. Hi Larry - Just wanted to drop you a line and say thank you on behalf of myself and the guys I was on a dive trip to Bonaire with for such a great morning out on the RIB with you and Ed even though the day we went out on the wild side was more a case of the calm side that day! That was on 26th Sept this year. You may remember that I was actually a non-diver so was able to enjoy your company on the boat while the others enjoyed the water. We truely had a fantastic time, we were all so impressed not just with the RIB but the way in which both Ed and yourself ran everything so efficiently from start to finish. We all felt we were in very good ands. Worth every penny (dollar) and more! We plan to visit Bonaire sometime again in the future so expect to see us and hopefully the waves will be a little bit higher this time ha ha! Attached is a photo of the guys in awe of the boat after the dive! They are still talking about it today. Thanks again and all the best. "First Mate" Julie! On behalf of the crew of the dutch warship Hr.Ms. van Galen, I whish to thank you and Eddy for a wonderfull adventure diving day. Everyone had a great time diving with the tarpons and swimming among turtles. I strongly suggest anyone visiting the beautifull island Bonaire to book a wildside dive with Larry, you will not be disapointed! We had a great time as usual. We had 44 divers on that trip. I tried to get as many as I could to your boat. There is only so much I can do! Eddy is good, was very professional, but he's not Larry. We are back in cold B.C.! Thanks again for taking our group out on the wildside! They all had a great time in Bonaire and some want to come back. Please tell Jan hello and thanks again for the rum punch party! Dennis has calls for work already and I have been busy doing office work! Hope to see you both in the near future! Hey Larry--thanks so much for a great dive last week, those 2 dives were the best of the 3 weeks I travelled for business. Unfortunately I returned to SC to unusually cold weather. Thanks again for a great dive! I look forward to diving with you again! It was great to hang with you and Jan last week while Stephanie and I were there. Tell Jan that her picture made it back to the US in one piece and it looks great hanging in my house. I went on your site and checked out every page. Your webmaster did a great job putting it together. Here's my website, if you could have her include it on your link page that would be awesome. It is www.bonaireresortrentals.com and you can check it out and see your site on my link page. Let her know she can email me if he has any questions. Look forward to seeing you guys again next time we're on-island and get wet again on the wild side! Talk to you soon. Thanks Larry and Eddy. Just Amazing. I have been diving over 15 years in many different places, but boy, this was one of my greatest diving experiences. You have your equipment setup so well organised, with a mind-blowing boat that handles any circumstances with ease. Diving on the wild site of Bonaire is unique for the Caribbean and your clear diving procedures and briefing suit the rough conditions well. It is clear you have thought this experience over many times and it gave us a feeling we were in good hands. Knowing that rough diving can still be comfortable, I recommend it to everyone!!! them drool. I will be back in Bonaire again and I will bring friends and we will come back and see you. Thanks for the adventure. Best wishes for a happy new year. As we look forward to a new year of vibrant life and adventure, we want to thank each of you who have touched our lives and helped make us what we are today. Thank you for your friendship and support. May each of your lives be touched by the majic that lives around us and the beauty that our world provides. Hi Larry - hope you had fun at the show, but we're sorry you weren't on Bonaire so we could visit! Eddie and Gijs took excellent care of us, however, and we all had excellent dives. 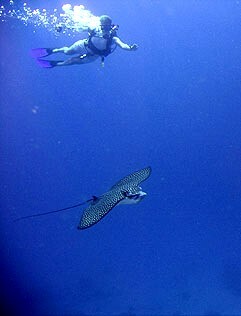 They even paid two eagle rays to wander bye during our first dive! Two of our friends, Virginia and Larry, might be coming back this week.. they had two weeks there, and wanted to do the dives again! Thanks again for arranging everything for us.. it was excellent! My family and I returned from Bonaire two weeks ago, and have spent much time watching and rewatching the video that was taken during our two Wild Side dives. What an experience! I had originally scheduled this dive for only my wife Jessica and myself, but Larry convinced me to bring my 14 year-old daughter, Lauren. She had the time of her life! Larry and Eddy provided the safest, most well-organized dive we have ever been on. Larry's boat is extraordinarily well designed, and very well suited for the rougher east-side waters. We saw several southern rays, hawksbill turtles, lobster, and a moray. Eddy was a great divemaster - he always saw and signaled wild life well in advance of when anyone else saw it. Our second dive was to the Blue Hole (aka White Hole, but we just call it "the Washing Machine"), where we saw several large tarpon, barracuda, huge porcupinefish, and were able to get up-close-and-personal with a feeding ray! It was raining during this second dive, which added an erie, surreal element to the experience. As great as the diving is in Bonaire, these were far-and-away our favorites. We will definitely be diving with Larry during our next Bonaire trip! Oh, and Larry's wife, Jan, is a very talented artist. We picked up several beautiful prints from her when we visited their home/studio the next day. Thanks again Larry and Eddy for the wonderful experience! Hi Larry (and Eddie). We had a great time diving with you the 23th of June. This was our third time to Bonaire and our first with you. Before diving with you we had seen one (1) Turtle an one (1) Spotted Eagle Ray on our dives on Bonaire (about 50 of them). One first dive with you we saw 7 Turtles and 4 Rays!! 4 more turles and 3 Spotted Eagels Rays ond the second dive! Amazing. The only down side was that the dives after The Wild Side was kind of mediocre. So our advice to those how want to dive with you is to dive with you in the end of their stay or even better dive one time in the beginning and one time in the end (at least). See you guys next year! Hey Larry, We dove with you and Eddy on May 2nd, and had a fantastic time. After all of the reviews and articles we read, we were really looking forward to diving the "wild side" with you, and we were not disappointed. As cold water divers, we have felt uneasy (on more than one occasion) with the lack of precaution or caution of many of the warm water dive operations we have come across ... but not so with yours. You run a top notch operation, and your emphasis on safety was not only welcome but appreciated. For me, your professionalism and concern quelled much of the additional anxiety that can come along with riding a boat and diving in rougher seas and swell. It was so much fun, and we would definitely do it again! PS - While I loved seeing the Sea Turtles and my first Spotted Eagle Rays ... I think the Juvenile African Pompanos were my favorite..
We had a wonderful time, wish you were there. We dove the reef and the Hole with Eddy and Gijs. They were wonderful. Professional, but still a lot of fun. We will join you again the next time. We just want to say what a great experience we had with Eddy and Giji diving the wild side. Honestly I was nervous about diving the east side, but as soon as Eddy talked to us about the dives and the boat I was comfortable. With Eddy and Gijs being so professional and safety minded put me at ease. We had 2 great dives. On the drift dive we saw 8 turtles, 2 large green moray eels, 7 spotted eagle rays and 4 stingrays. 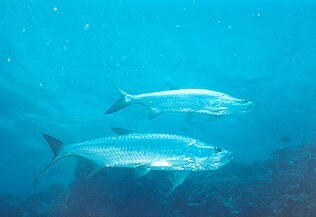 Then we went to the White hole and swam with over 150 tarpons (and I am not kidding). It was like being in a fish bowl. The waves were 8 to 10 feet and I still had no problem getting back on the boat and felt safe. What a great experience !! One that I highly recommend to everyone that goes to Bonaire. Eddy and Gijs are the best ! Hi Larry & Eddy! Last september I had two great dives with both of you. I did enjoy the trip on the boat and the two dives. So in three weeks we will visite Bonaire again and of course I will make another trip to the wild side! See you. This thank you note is a bit overdue …. This was our fifth year to Bonaire and we felt long overdue to dive the East side.We heard great things about Larry’s operation and decided to check it out. We met Larry and Eddy at the fishing dock and they helped us set up and load our gear. We were soon underway to the dive sight, Larry’s boat handled the waves easily and we had a great ride out. We entered the water for a 50 minute drift dive. Eddy the dive master put our safety and comfort as his first priority. We saw multiple green moray eels, multiple sea turtles and had a close encounter with a pair of friendly eagle rays…….All IN ONE DIVE!!!!!!! After the safety stop we surfaced and found that Larry was there and had literally removed a side panel on his boat and extended a ladder…. Even in 3 foot seas the exit was very easy due to the fact that you and the ladder go up and down at the same time, unlike a typical ladder exit at the rear of the boat. Thanks again Larry and Eddy for the awesome dive and great time. We like to say hello to Eddy because we know him and he is a very nice guy with lots of fun and also for a very good dive!!! Specially the night dives at Town Pier. Do you remember us now? We are Herman & Renate from Holland and hopefully we come back to Bonaire in April/May this year for 3 weeks of holiday. We just have looked at the video at the site of Larryswildsidediving and it look very great there below at the east side of Bonaire. Earle & Helen(Scott) Lawrence had a most wonderful experience when we did a dive with a Larry and a group from Chicago in 2005. It was quite an adventure! When we go back to Bonaire I'm sure Larry's will be on our list of "to do dives". I am Mike Parnell Owner of Mike Parnell's Pro Scuba in Chicago. 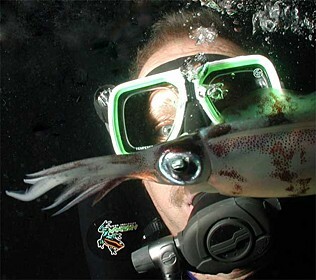 I had the privilege of diving with Larry this past September 2006 along with my dive buddy, Bernard Conyers. What a great experience that was. I have been diving Bonaire since the early 1970's and although other parts of the island offer excitement, none can compare with Larry's experience. Larry has a very professional operation with primary emphasis on diver safety, and from a dive professionals point of view that is paramount. I feel very comfortable referring my clients to him with assurance that they will not only encounter safe and courteous service, but it will be an enjoyable experience that they will remember throughout their diving adventures. Thanks Larry, I look forward to diving with you in the very near future. This is Frank and Ed from New Jersey, I had The most excellent dive of my life with Larry, he is the most proffessional, well organized and safe dive boat I have ever been on. His divemaster Martin is also top notch, brought us to about 6 turtles, and to schools of tarpon at Blue hole, I would fill 100 pages of your guestbook praising them, Thanks Larry and Martin!!! A MUST do when in Bonaire at least twice. The best boat diving I have ever done, anywhere. This unique boat is set up for easy entry and exit from the water. Larry and Martin's first priority is safety with a great dive a close second. Martin can find sea life that most would swim by and never see. When you go, stay close to him, you won't be disappointed. 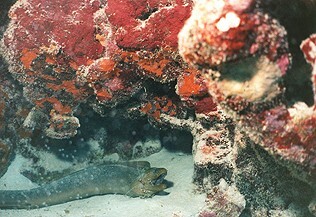 Hi larry, If you haven't done the wildside with Larry, you didn't dive bonaire.